Over the past fifteen weeks, we've been enjoying a great story--the story of a Master Mason (the Craftsman Joe Hardwick) who was commissioned to build a mandolin for another Master Mason (the author of the series R.W. B. Michael H. Shirley). Along the way, we've learned something about the history of the mandolin, about its use in American music, and quite a lot about the craftsmanship involved in creating such a remarkable instrument from scratch. 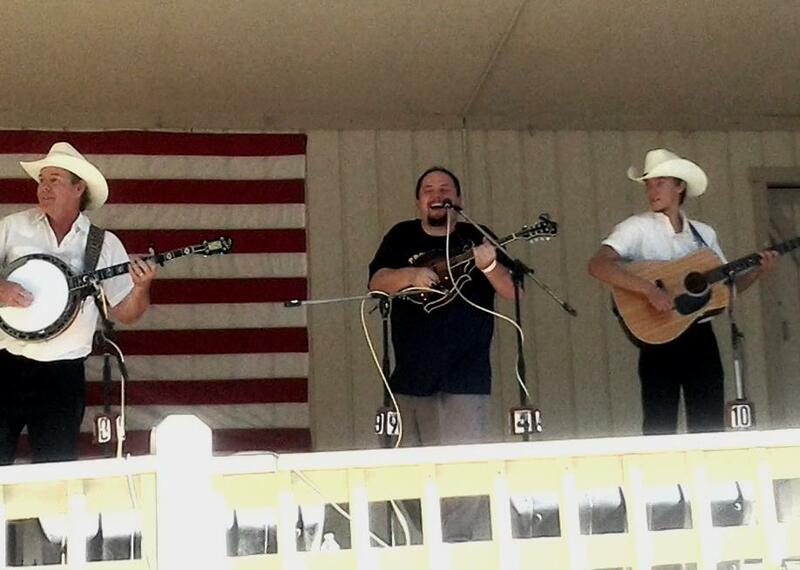 Part I: Michael Shirley commissions his friend and Brother Master Mason, Joe Hardwick to build him a custom mandolin. "One of the hard things about moving to a new town is finding people who can fix the shaky house you’ve bought. Sometimes, though, you get lucky. When we moved to Tuscola, Illinois, in 2002, I had bookshelves to attach to the wall. 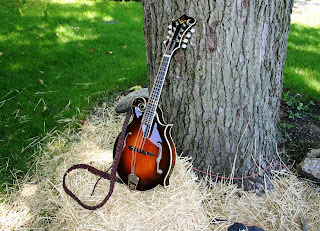 Since I wanted them to hold the books and stay upright, I figured I needed someone to put them up..."
Part II: A little history lesson about mandolins, and the history of mandolin manufacture in America. 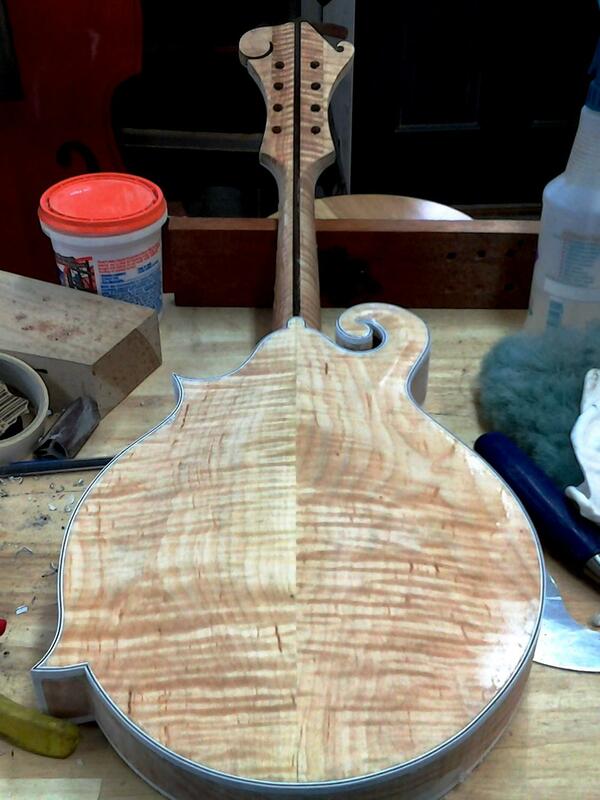 "The story of the Master Mason Mandolin’s journey from concept to completion needs an atlas. 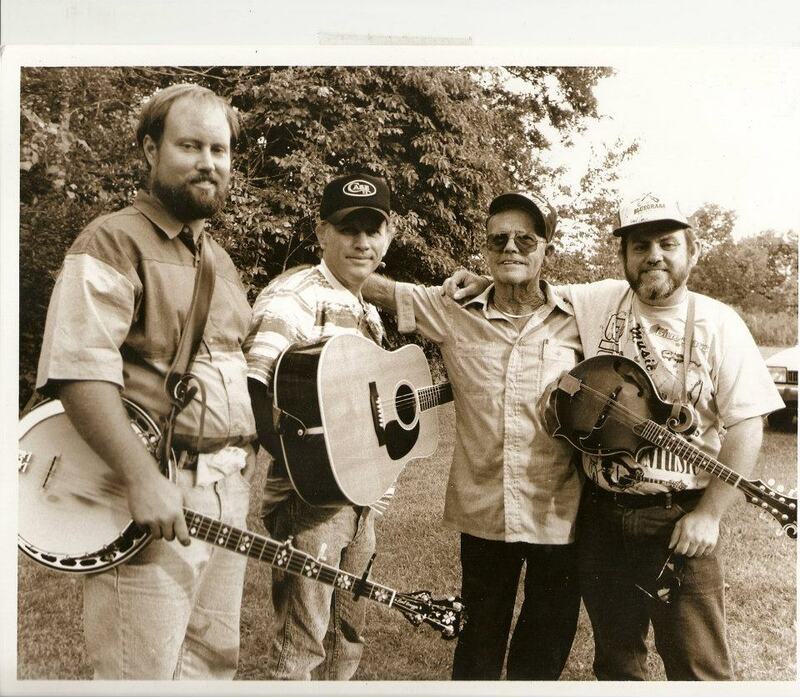 Brother Joe Hardwick and I have lived and breathed bluegrass music for most of our lives, so it’s easy for us to forget most people don’t know what we’re talking about. 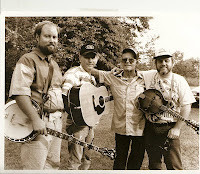 For the benefit of readers, our families, and random strangers, here’s an introduction to mandolins, bluegrass, and various random fact . 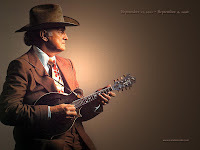 . ."
Part III: Mandolins and their evolution in American Music, and the contributions of musicians like Bill Monroe. 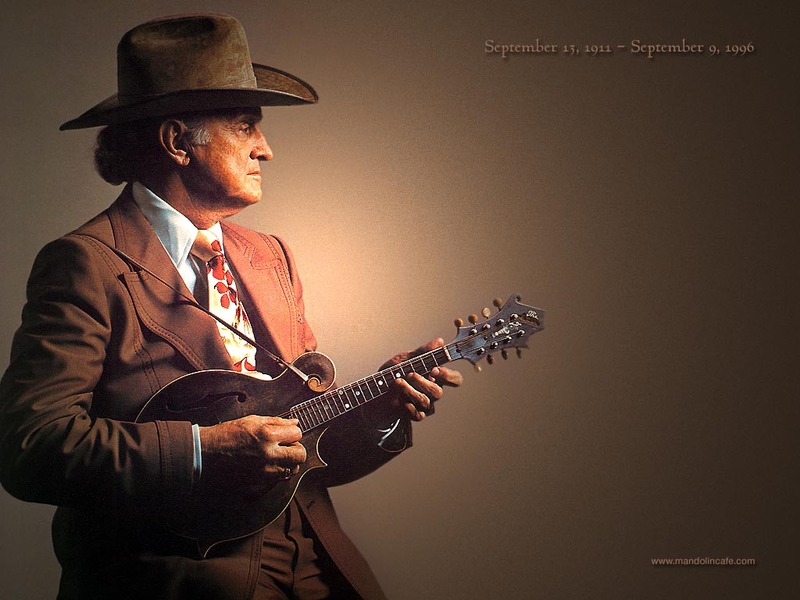 "That mandolins in general, and the F5 in particular, are associated today primarily with bluegrass music is due entirely to one man: Bill Monroe, the Father of Bluegrass Music, and a member of both the Country Music and Rock and Roll Halls of Fame. 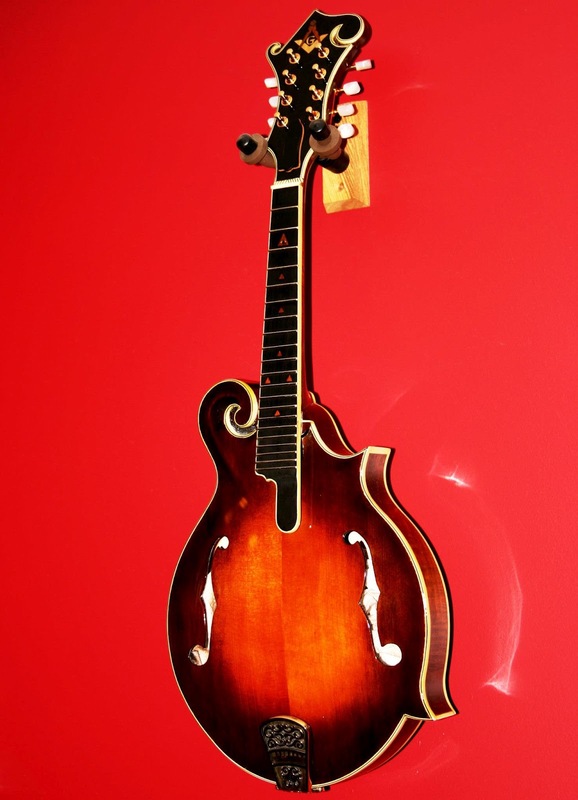 Monroe, who was born in rural Kentucky in 1911, had been a professional musician with his brothers since 1929 . . ."
Part IV: Joe Hardwick begins building Michael's custom mandolin--and from the beginning, the symbols of Freemasonry were part of the design. "When Joe Hardwick and I started discussing the mandolin he was going to make for me, we didn’t have much trouble with the basics. 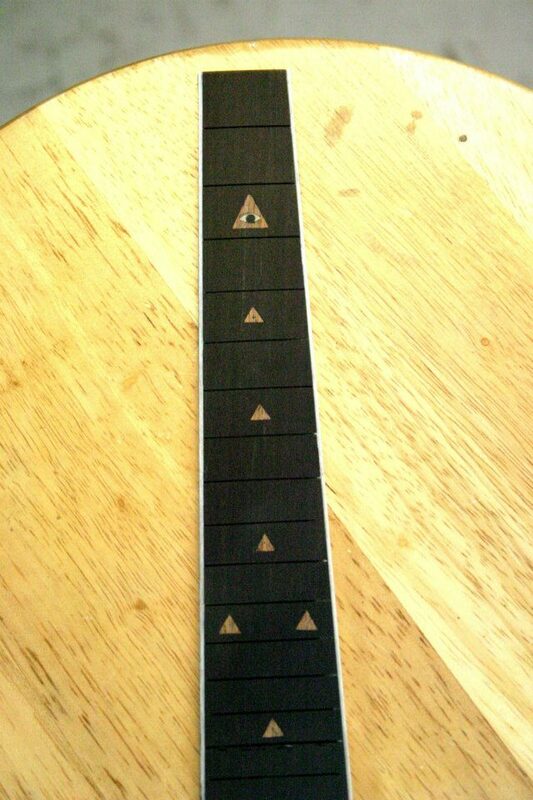 It would be an F5 model with a vintage look but no pickguard, binding around the body, the neck, and the headstock, and kind of brown in appearance. It probably doesn’t say much for my artistic sensibilities that I really like brown. 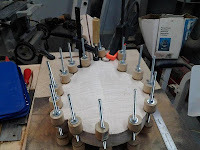 Anyway, that much was fairly clear, and I trust Joe enough to go with his instincts, but the headstock inlay required some thought . . "
Part V: Design work continues. Headstock inlay is complete, and Joe gets to work on designing the fretboard--again, the symbols of Masonry apply for admission in the design, and Joe works it into the fretboard. 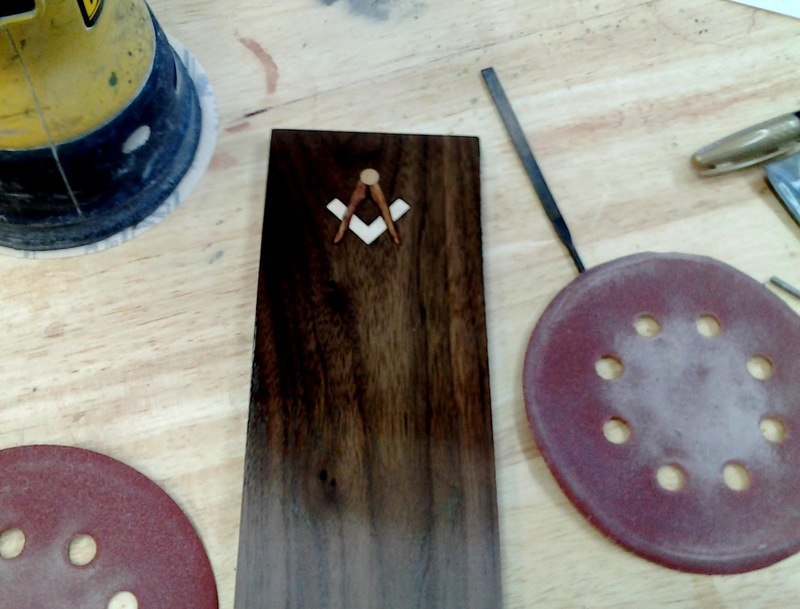 "Joe Hardwick’s inlay test piece made it onto the headstock in good order, with the square in maple, the compasses in sapele, and the hinge in walnut. The square and compasses looked perfect, and I figured that the G wouldn’t be necessary. 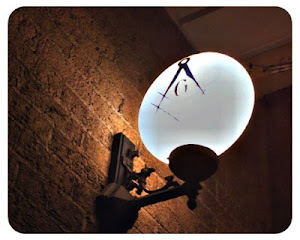 After all, the English Masonic symbol lacked the G, and it looked pretty good. But Joe’s a perfectionist, and one evening, after working in his shop for a couple of hours with a jewelers saw . . ."
Part VI: Joe Hardwick begins laying out the body of the mandolin, as Michael Shirley waits . . . "One of the problems with having an instrument built for you is waiting for it. I’ve never been very good at waiting. Procrastinating, yes, but waiting is different. It requires patience rather than laziness. 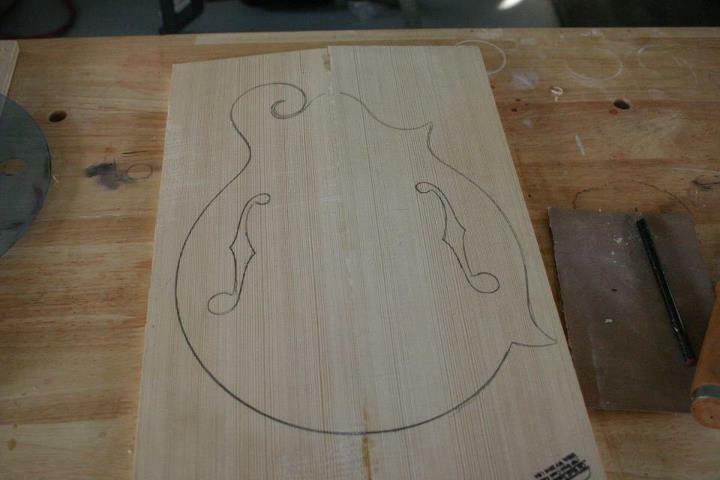 But this mandolin building process has shown me something new. Joe has been posting pictures as he completes each new step . 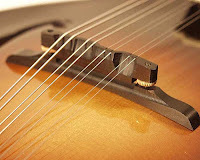 . ."
Part VII: Michael Shirley shares more history about the mandolin and mandolin music. "The classic form of an F-5 mandolin hasn’t varied much since Lloyd Loar invented it and Bill Monroe made it desirable above all others. Some luthiers have paid homage to it while changing it a good deal, most notably the great John Monteleone, with his elongated scroll and entirely different headstock. But there’s something unexplainable about the standard F-5 . . ."
Part VIII: Joe Hardwick begins the assembly process so they he can begin staining the instrument. 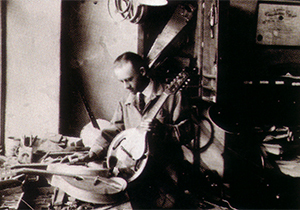 "Before he could give the mandolin any color, Joe needed to put it together. The neck needed to be attached to the body, the binding needed to be glued on, the fingerboard needed to be glued to the neck (who knew rubber bands could be so useful? ), and everything needed to be scraped and sanded smooth." Part IX: Joe Hardwick begins the process of staining the mandolin. "I’m not sure about other musicians, but I want an instrument that appeals to the eye as well as the ear, so the color and visual tone of the Master Mason’s Mandolin mattered a lot to me. Fortunately, it mattered to Joe too. We both like the look of old wood, and we both wanted the mandolin to have a vintage look, so a stain with wood tones was the logical choice." Part X: The stain is only the first step in the process, and once complete comes coat after coat of sealer. "Now that the stain was as Joe had envisioned it, I figured we were close to being done. Not hardly. Next came four coats of sealer and three pictures that occupied most of my day. Work? Nah. I just stared. Then came the last coats of sealer, with more staring." 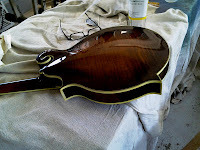 Part XI: Now that the lacquer has been applied, Michal Shirley talks a little bit about the craftsman's art as he waits the 14 days it takes for it to dry. "With the last of the lacquer applied, the Master Mason’s Mandolin was nearly done, save for sanding and polishing. But that would have to wait until the lacquer was completely dried, which might take up to fourteen days. And so I was able to think a bit, and reflect on what it was that Joe Hardwick was accomplishing. He had spent considerable time on this task, learning more as he went, thinking through each step with all he had learned from years of learning and preparation for this, his Master Piece." 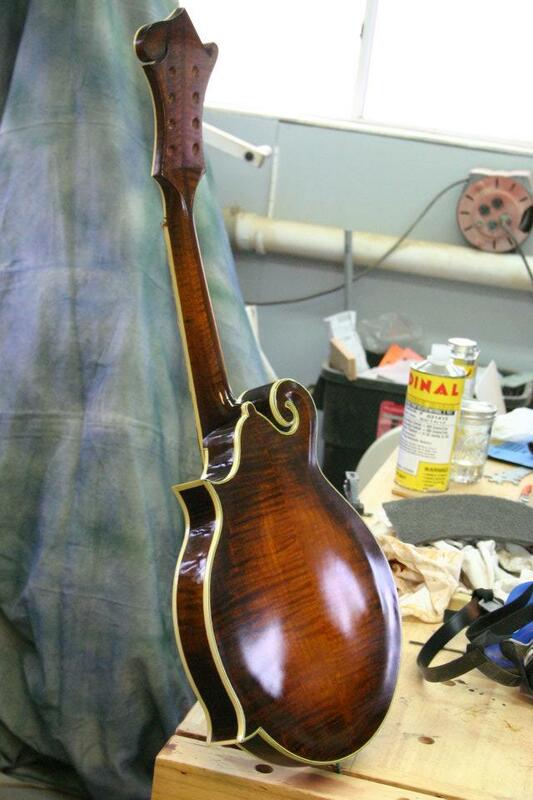 Part XII: Still waiting, Michael Shirley keeps track of the progress of his new mandolin on Facebook. 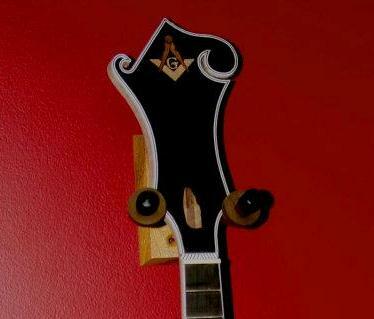 "I’d been keeping track of the Master Mason’s mandolin’s progress on Facebook, and frequent updates had had me hitting refresh at odd hours. But now that the finish needed to dry thoroughly before Joe could polish it, I was having withdrawal pains. After about ten days they were down to a dull ache, so when Joe texted me that he had just posted a few new pictures, I actually didn’t immediately sprint to the computer. It was more of an urgent canter." Part XIII: The precision engineering required to craft a perfect instrument. "If you recall hating geometry in high school, didn’t do very well at it, and wondered what use it could ever be in “real life,” don’t try building instruments. Joe Hardwick had pitched the angle of the neck on the Master Mason’s mandolin a bit more than normal in order to make it louder, but he had to be careful, since by doing so he also increased the pressure on the bridge and thus on the top of the mandolin itself, which made a break more likely."